'Seeking News From Nowhere' an exhibition of works by British artist Benjamin Deakin. The show explores the notion that search for a utopian environment for living is possibly a dystopian one in itself. The technique and tonal sensibility employed in these works serves to draws in the viewer with a palette of pastel tones, mellow, soft and soothing hues that conjure up a sense of near-neutral yet heightened Romantism of nineteenth century traditional landscape paintings. Even with observations and investigation into the so-called 'edgelands' of abandoned railways, industrial scrubland or retail parks, Deakin attempts to dissolve these in his painting by creating spaces with a sense of vulnerability. 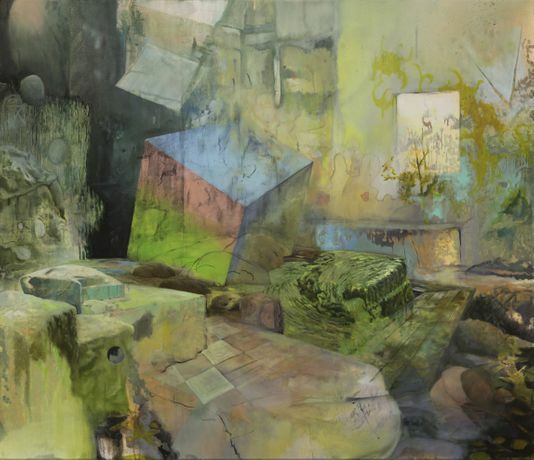 In the painting 'Navigator' we witness the state of an artificial giant cube juxtaposition against natural rocky planes as that very volume dissolving through a secondary plane creating an oscillation in the perceived distance and depth. This conflicting vanishing points lends itself to Deakin's continued exploration of thresholds. On the other hand, in the 'Multiplier' the perception of distance constantly shifts through the destabilisation of the flat illusionary surface. The entire environment seem to be melting or dissolving into a single matter as the internal wasteland ruin merges with the external natural environment. Nature providing the draping melting curtains over the artificial man-made intervention of brick wall and interior ruins. This paradox is a consistent strand in Deakin's paintings. As in previous works where we have seen mountain scenes reminiscence of nineteenth century paintings of Yosemite National Park or the Rocky mountains juxtaposition against debris and gravel piles of the Canadian gold-mines that the artist observed first hand.